The Cabbage Palm Tree is often used as a street planting. It can, however, benefit a home landscape setting. Although cabbage palms have been known to reach heights of 90 feet, they generally remain under 50 feet tall. Their trunks are fibrous and their foliage dense, which consequently provides individuals with a nice shady area to take refuge under during those hot summer months. Novice gardeners need not worry, as caring for a cabbage palm is quite basic. The Cabbage Palm Tree is native to North America. 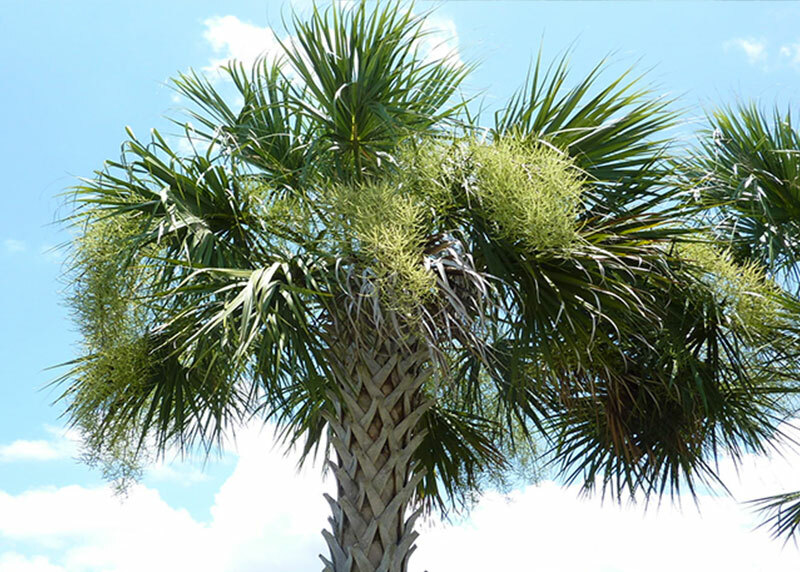 The Cabbage Palm has a single, gray, un-branched trunk covered with old leaf bases, also known as boots. Leaf bases create a crise-cross pattern. It gets smoother as the palm matures. Trunk is about 10 - 15 inches in diameter. Because there is no crown shaft, large leaves grow right from the trunk spreading in all directions 10 - 20 ft wide. Leaves range in color from bright green to deep olive green. Spineless stems are about 5 - 6 ft long. The Cabbage Palm has costapalmate type leaves, mix of palmate and pinnate, or mix of feather shaped and fan shaped leaves. Leaves have 50-80 leaflets that are about 1″ to 2″ wide. The Cabbage Palm is very durable and resistant to breaking with strong root system which penetrates the soil to 15-20 feet deep. In the summer, the Cabbage Palm bears small creamy to white flowers that droop in clusters from within the crown. Fragrant flowers are held by 2ft long branching inflorescence. Flowers are followed by a black fruit 1/3 inch with a single seed inside. The Cabbage Palm fruit is edible. In the wild Cabbage Palm can grow up to 80 ft tall, but in cultivation it usually does not get higher than 30 - 40 ft tall and 10 - 15 ft wide.